Update: This isn't the latest version of the Paperwhite, and it's worth bearing in mind there's a more recent Kindle Paperwhite 2018. You can still sometimes find the third generation Kindle Paperwhite on sale, and we've found the price drop. 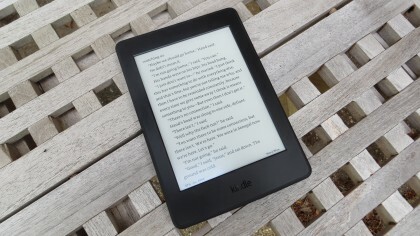 With its small form factor and built-in reading light, the Kindle Paperwhite (2015) held the crown as Amazon's most popular ereader for a long time – and it's easy to see why. But the best bit is that the pixel boost actually puts the more affordable Paperwhite on par with the more expensive Kindle Voyage and Kindle Oasis. With a starting price of £109.99 ($119, AU$190) the Kindle Paperwhite is far more wallet-friendly than the extravagant high-end devices but we've also seen the price drop to around £90 / $109 / AU$174. The Paperwhite's price originally went up to £119.99 ($139, AU$139.99) if you want it without adverts and up to £179.99 ($209, AU$209.99) for a version with 3G and no adverts. On the other hand you can get Amazon's most basic Kindle from just £49.99 ($79, AU$109), but with a screen that's almost twice as sharp and has a built-in light, the company is clearly hoping buyers will continue to see the value in its Paperwhite model. The Kindle Paperwhite (2015) does have some new features and improvements over the second generation model that are worth highlighting. In fact, in theory it's quite a big improvement over the previous model. Probably the biggest improvement in the new Kindle Paperwhite, and the biggest reason to consider upgrading to it if you already have an earlier model, is its 300ppi screen. That's up from 212ppi on the previous model, and it makes a big difference. Text is sharper, making it less of a strain to read, which if you tend to spend hours getting engulfed in a good book is a very important factor. It also means it's more comfortable to read tiny fonts if your eyes are up to it, making it feasible to fit more words on each page. Amazon even goes so far as to call it print-quality, which I can just about believe. Pixels are almost imperceptible, and with the built-in light the reading experience is if anything superior to reading off a printed page, particularly when the lighting is otherwise sub-optimal. Amazon has created its own typeface, called Bookerly, and it's making its ereader debut on the new Kindle Paperwhite, though it's not an entirely new thing as it's already available on Amazon's Fire tablets. It's been inspired by existing typefaces, particularly Palatino and Caecilia, but it's designed for use on digital screens, with the aim of helping users read faster with less eyestrain at any type size. While that could all easily be dismissed as marketing nonsense I have to admit to being a fan of it. It's far from game-changing, but it's slightly easier to read than Baskerville, more modern and elegant than Futura and less harsh than Helvetica, to name three of the alternatives offered by the Kindle Paperwhite (2015). It's not a reason to buy the new Paperwhite over any other Kindle, as many have now received the Bookerly font in a software update anyway and the difference it makes is marginal and in part surely comes down to personal taste. But it's a nice font, I like it and I plan to stick with it. 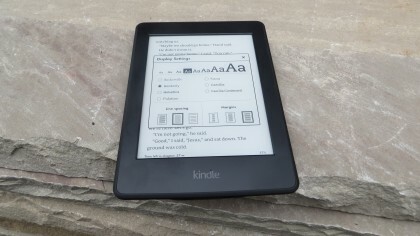 Amazon has also outfitted the Kindle Paperwhite (2015) with a new typesetting engine and this changes things in ways which are both subtle and significant. 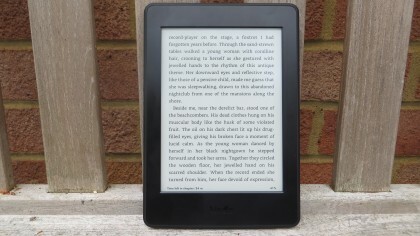 The sharp screen and useful built in light of the Kindle Voyage – and to some extent previous generations of the Kindle Paperwhite (2013) – in many ways replicate and even improve on the experience of reading a printed book, but typography has always been a weak link. It's more obvious in some titles than other (and to some readers than others), but previous Kindles have been known to lay out words, paragraphs and even whole pages in an awkward manner. It's often as simple as slightly awkward spacing between letters and words, leading to too much white space, or words and paragraphs being broken up poorly. It can be distracting, and even if you don't notice it there's every chance it's slowing down your reading. The new typesetting engine aims to fix all that, as well as making larger font sizes more readable with reduced white space and no more broken sentences. It also adds drop caps where applicable, which previously were often absent from ebooks. 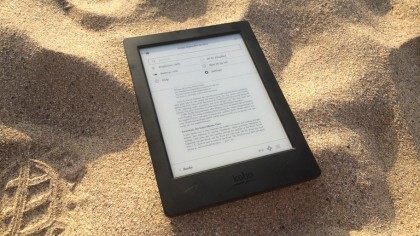 It's a huge step towards fixing one of the biggest problems Kindles still have, and while it currently only works on a subset of Kindle books, that subset numbers at well over 500,000 with more added all the time. The new Kindle Paperwhite doesn't really look any different to the old Kindle Paperwhite (2013), which is to say it's not much of a looker at all, with a plain black plastic shell, broken up only by Kindle branding below the screen on the front, Amazon branding on the back and a micro USB port and power button on the bottom edge. The bezels are fairly sizeable but that's no bad thing here, as it gives you somewhere to rest your hands without obscuring the screen – or worse, accidentally turning the page. It's a plain design but it feels solid and well built. At 169 x 117 x 9.1mm it is, as Amazon loves to remind you, smaller than a paperback, while the Wi-Fi + 3G model that I tried came in at a surprisingly weighty 217g. I say surprising because it's heavier than it looks, not because it's in any danger of actually weighing you down and if you opt for the Wi-Fi version it's a slightly daintier 205g. It's certainly small and light enough to hold comfortably with one hand. With its recessed display and plain design, it's got none of the style of the Kindle Voyage, but that's OK, as all it's meant to be is a window into your books. If you want to add a little style, Amazon also offers a fairly attractive form-fitting leather cover with a metal clasp. Like other Kindles there's no microSD card slot, but there is enough storage built in for thousands of books, and if you have more than that there's also cloud storage for any books purchased from Amazon. A Kindle is only as good as its screen, and this is one area where the Kindle Paperwhite (2015) really excels. Its 300ppi display really is a step up and it makes ereading a more pleasant experience than ever, and of course the built-in light has made a return too, ensuring you can comfortably read even in dark environments. The act of reading is much the same as ever. A tap on the centre or right of the screen will turn to the next page, which it does quite speedily, while a tap to the far left edge will turn it back one and a tap on the bottom left corner will let you switch between viewing the estimated time left in the book, or in the chapter, or the page or location you're on. Finally, a tap near the top will bring down a menu bar which lets you customise the reading experience. This allows you to quickly change the brightness, search for something in the book, jump to a specific chapter, or change the font, text size, margins and line spacing. You'll find the new Bookerly font here, though the Kindle Paperwhite (2015) defaults to it anyway. I talked about this in the key features section, but in short it's a good font. It looks attractive, doesn't seem out of place in a book, and importantly it's easy to read. There are six other font options though if you're not a fan of Amazon's creation, and text can be made very large, which could be handy if you don't have the best eyesight. Other Kindle staples are also only a tap away. There's X-Ray for example, which lets you explore the "bones of a book," as Amazon puts it, to learn more about its characters and themes. If you're ever unsure of what a word means when reading you can just long press it to get a definition. You can bookmark pages, highlight text, read in landscape view and enable Word Wise to see definitions of unfamiliar words above the words themselves, so you don't even need to look things up. There's a lot here and most of it's useful, but it's no surprise as Amazon has been improving its Kindle software for years. Despite all those years of work, the actual typography has always left much to be desired. Perhaps the single biggest issue was Amazon's insistence on keeping the margins straight. That might not sound like such a bad thing, but it meant that gaps between words could be uneven and sometimes ludicrously large, especially when using a larger font. Thankfully Amazon has finally fixed this. You can see what I mean in the image above. On the left is how it was and on the right is how things are with the new typesetting engine, though currently not all books are supported by it. The improvements go beyond word spacing though. Character spacing has been tweaked too. Rather than having an equal gap between each letter it now looks at pairs of letters and ensures they're spaced in such a way that they fit better together. Page layouts have been improved as well, for example with the addition of drop caps, while text and images conform more faithfully to the layout of printed books. All of this makes reading on the new Kindle Paperwhite faster, easier and more pleasurable than ever. But if you're stuck on an older Kindle there's no need for jealousy as the new typesetting engine and Bookerly font have come as a software update to other recent Kindles. 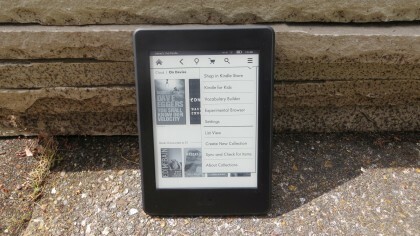 The Kindle store is packed full of content, with millions of books available, though actually navigating it is easier from a computer than the Kindle Paperwhite itself, with its greyscale display and slightly slow to respond touchscreen. The good news is that you can easily send a book straight to your Kindle when shopping on another device, though. Still, if you do want to shop on the Kindle itself that's an option, and if you go for the 3G version you don't even need a Wi-Fi network. Prices are generally pretty competitive too. You'll know what to expect here if you've owned a Kindle before, but books are rarely more than about £5 (US$8, AU$12) and can often be picked up for as little as around £1 (US$2, AU$1), especially if you get them in one of the many Kindle store sales. 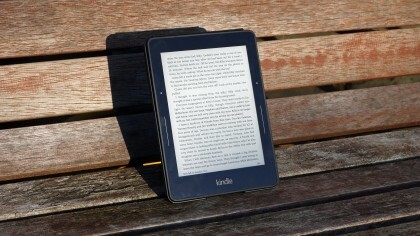 The Amazon Kindle Paperwhite is a device which can supposedly last for weeks on a single charge. However, that's an estimate which seems to assume you don't read for long each day and don't leave data connections on. That said it certainly doesn't seem lacking in life. As an example after my first three days of use it went from a full charge to a half full indicator (sadly it doesn't get more precise than that). That doesn't mean you can only expect a week out of it though. In order to test the Paperwhite out the screen was inevitably on a lot of the time. I spent around four hours actually reading and lots more time testing out the various functions. The brightness was also more than half way up at all times, Wi-Fi was on most of the time and when it wasn't 3G was. With more typical use of around thirty minutes to an hour's reading each day, but leaving Wi-Fi on and the screen at half brightness, it was able to last roughly two weeks on one charge. That's not too bad a showing and it seems fairly comparable to my first generation Kindle Paperwhite, despite the fact that this one has a far sharper screen. Keep Wi-Fi off and Amazon reckons you can get up to six weeks out of it, which isn't totally unbelievable. 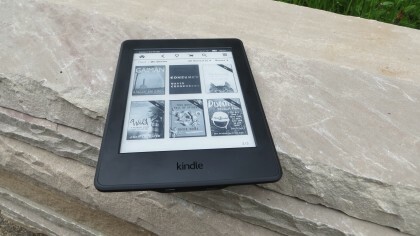 The Kindle Paperwhite's main competition comes from, well, other Kindles, with the basic Kindle and the Kindle Voyage offering cheaper and more expensive alternatives respectively. But there are a few rival brands trying to make a dent in the market, with Kobo and Nook in particular both offering a range of alternative ereaders. When Amazon announced the Kindle Voyage, I didn't think there could be a more expensive ereader product from the company... but I was wrong. The Kindle Oasis is the best experience you'll get with a Kindle, but it will cost you. The Oasis is much brighter than the Kindle Voyage, which is brighter than the Paperwhite, and it has a brand new design to make it even easier to hold one handed. But the price is through the roof at $249.99/£229.99/AU$389. If you think you'll use a Kindle every single day and want to get the best money can buy, the Kindle Oasis may well be the choice for you. The new Kindle Paperwhite matches the Kindle Voyage's resolution at 300ppi, so there's now less reason to choose Amazon's premium model, but there are still a few reasons for the Voyage's higher £169.99 (US$199, AU$299) starting price. 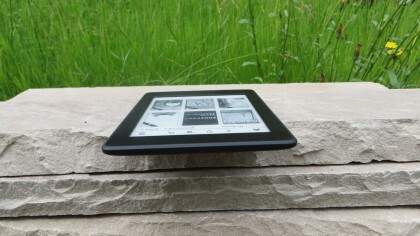 For one thing it has an ambient light sensor, ensuring the built in light is automatically adapted to provide the optimal brightness for your surroundings, which is handy and you can always turn it off if you and the Kindle disagree about what the optimal brightness is. It's also got physical forward and back page buttons as well as the standard touchscreen ones and it packs a slightly more premium build. None of these are particularly essential features, but if price is no object the Kindle Voyage is undeniably still a better ereader than the Paperwhite. 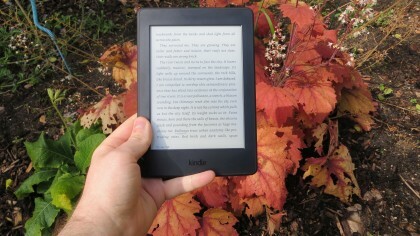 With prices starting at just £49.99 (US$79, AU$120) the basic Amazon Kindle is a truly entry level ereader. It has a touchscreen, but it's nowhere near as sharp as the Paperwhite's display and there's no built in light, which are two major marks against it. 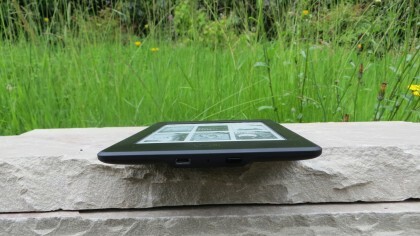 If money's tight or you don't expect to use it much the Amazon Kindle is absolutely fine. 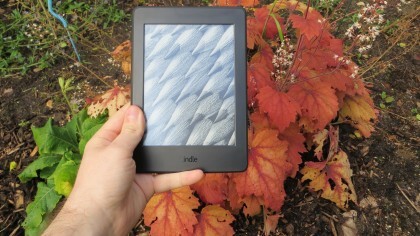 It's brilliantly good value, has the same impressive library as the Paperwhite and a similarly long-lasting battery. It's also been updated to support the new typesetting engine. 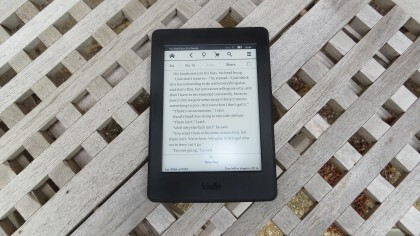 But if you're an avid reader you may find yourself craving the improvements offered by the new Kindle Paperwhite and spending more money in the long run. 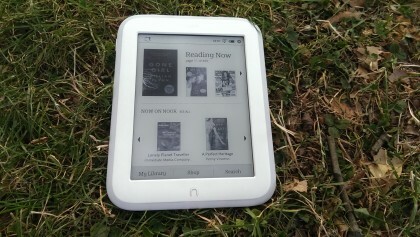 If you're not sold on Kindles or want something in between the basic Kindle and the Kindle Paperwhite the Nook GlowLight could be for you. 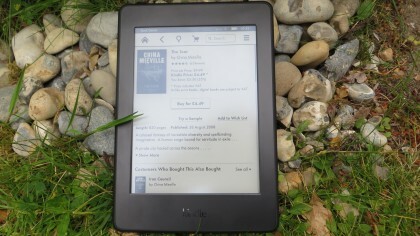 It has a built in light of its own and a large selection of titles on its store and yet it comes in a little cheaper than the Kindle Paperwhite (2015) at around US$99. You now can't buy this in the UK though, sadly. But with a laggy interface and a lower resolution 212ppi screen it can't quite match Amazon's latest. At around £30 cheaper it doesn't have to but I'd still be inclined to say the Kindle Paperwhite (2015) is a better buy if you can stretch to it. At around £140 (AU$229) the Kobo Aura H2O is a fair bit pricier than the new Kindle Paperwhite, almost rivalling the Kindle Voyage. But it's got a trick up its sleeve that neither of those devices can match, namely the fact that it's water and dust proof. How important that is will largely depend on how likely you are to read in the bath or on the beach, but I'd wager that it's a useful feature for quite a lot of people. Other than that, it's a standard yet fairly accomplished ereader, with a bright screen, a well-stocked store and good battery life, but its screen isn't quite as sharp as the Paperwhite's. I'm a big fan of the previous Kindle Paperwhite (2013), so there was never much doubt that I'd like this one, since it's essentially the same thing again, but with a better screen and some software improvements. The real question is simply whether that's enough to justify a new model, or to tempt anyone who's resisted the Paperwhite in the past. The new 300ppi screen is far and away the best and most vital feature of the new Kindle Paperwhite. While the previous generation display hardly seemed lacking in clarity the new one is sharper and your eyes will thank you for it, especially if you like to use small font sizes. The new typesetting engine is a big improvement too. Along with the attractive Bookerly font it makes things that little bit more readable, though both of these things have come to other recent Kindles as a software update, so don't ditch your old model on the strength of them. Other than that it's the same Kindle Paperwhite as ever, with the same interface and features. If you've owned a Kindle before you know what you're getting here and if not, know that no one has cracked the ereader like Amazon. 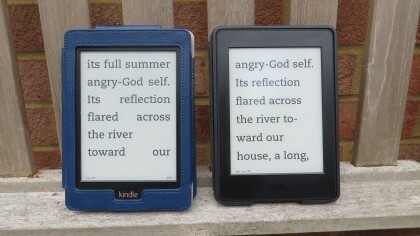 The new Kindle Paperwhite is great, but it's not much of an upgrade over the old one. The only major change is the screen, while the remaining headline features have come as a software update to other recent Kindles. 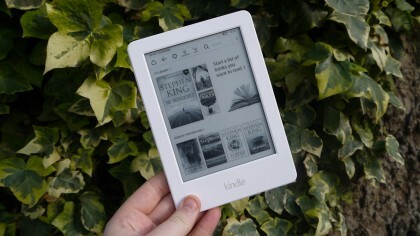 Amazon is coming pretty close to creating a perfect ereader, so it's inevitable and not that much of a problem that many things will stay the same year after year, but it does mean the new Paperwhite is overfamiliar if you've used any recent Kindle. And there are some things that we'd love to see change for the better. A more premium design would be nice for one. The Kindle Voyage goes somewhat in that direction but there's room to go further. Or if not more premium then how about waterproof? The Kobo Aura H2O is, and if you like to read in the bath or by the pool, it's a good insurance policy. As good as it is the new Kindle Paperwhite seems like a fairly conservative upgrade. The upgrade also puts it on a par with the sharpness of the Kindle Voyage, giving buyers one reason fewer to opt for that while retaining the previous Paperwhite's starting price of £109.99 ($119, AU$190). 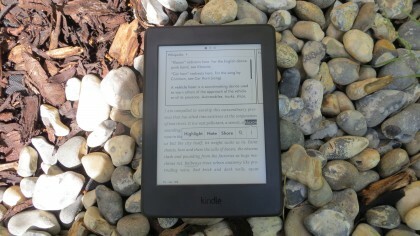 In short, it's the best Kindle Paperwhite yet and arguably the best value ereader on the market. 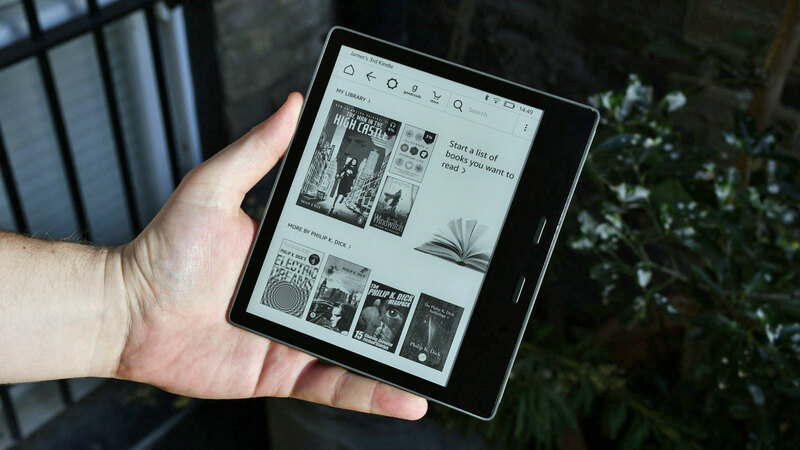 It's still lacking a few of the Kindle Voyage's extras, but it's got the core features that you need – a touchscreen, a sharp display, a built-in light and a massive library of books. It's light on new and exclusive features, but it's a device that might not need upgrading for years and yet it still comes in at a reasonable price. 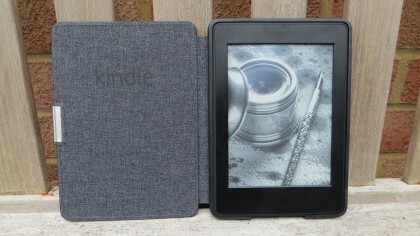 If you don't already have a Kindle and aren't made of money this is the one to buy, while if you have an older model the screen improvement is just about substantial enough to warrant an upgrade. It's not exciting, but it does have the most well-rounded mix of price and features you'll find on a Kindle.